Capt. 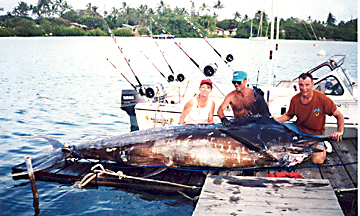 Wayne Morgan of the PESCADOR, a 171/2-foot Alii Kai skiff, hooked this monster marlin on a 14/0 Penn Senator loaded with 150-lb test line and a Joe Yee Super Plunger. Sandy Haught spend 31/2 hours on the reel before the fish died and the next two hours were spent planing it to the surface. A pack of sharks followed them back to the harbor and were appeased by the crews throwing saba to the hungry mob.